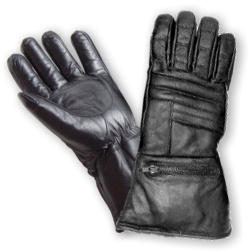 This glove is also called the all weather glove. It has the thermal insulation and warm lining to keep the hand hot during the winter. It also have the rain cover in zipped packed pouch to wear while raining. A good looking style and generally wear by police officer. The full cowhide leather outer shell feature and enhanced up wrist style. o Cowhide Anlaline outer shell. o Zipper packed nylon rain cover.